Y-Fang Bubble Tea Sealer Machines are the industry leader. Bubble Tea was invented in Taiwan and the best bubble tea equipment and ingredients come from Taiwan. Y-Fang is the industry leader in Taiwan and produces the most reliable bubble tea sealer machines. 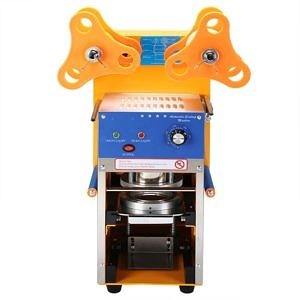 These sealer machines are used in bubble tea shops all around Taiwan and the world. Instead of cheap Chinese made knockoffs, these are genuine machines that are built to last. Y-Fang has the advantage of over 20 years of experience in the sealing and packing industry. Y-Fang offers a 90 day warranty on the parts and a 1 year warranty on the PC-Board of the sealer machine. The most popular model is the 999SN. It is completely automatic, can seal 450 cups/hour and has a LED panel. This machine comes standard with a 95mm sealer ring but can also be upgraded to a Universal 98mm Sealer. Y-Fang also produces Quantitative Fructose Dispensers. These will automatically put the right amount of sugar into your bubble tea with the touch of a button. 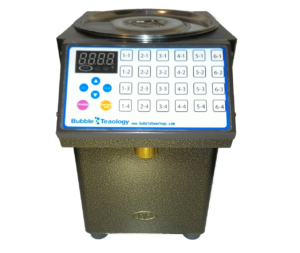 This will help produce consistent drink quality for your bubble tea or coffee shop. It also saves on employee training costs. No more measuring, just press and button! We have a lot of customers come to us who first bought a cheap knockoff sealer machine from eBay or Amazon only to have it break in a few months. Y-Fang sealers are the most reliable on the market and with proper maintenance can last for years. We provide maintenance instructions and video support. 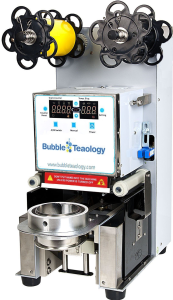 Although bubble tea and drink shops are the largest users of sealer machines. Sealer Machines are also popular for sealing other items such as yogurt, cosmetic supplies and food products with the larger sealers. We can seal almost anything!